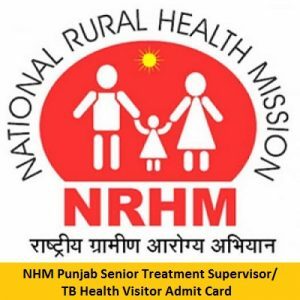 Good news for the candidates who are waiting for the NHM Punjab Senior Treatment Supervisor Admit Card 2019 / NHM Punjab TB Health Visitor Admit Card 2019. It is expected to be released in the month of March 2019. Aspirants can download their Hall Ticket directly from the link which is present at last of this page. National Health Mission Punjab organization members had said that the exam date will be intimated later on the University’s website (www.bfuhs.ac.in). National Health Mission Punjab committee is going to conduct the examination to fill the 137 Senior Treatment Supervisor, TB Health Visitor Posts. Competitors who are attending that examination must carry their NHM Punjab Senior Treatment Supervisor Hall Ticket 2019 along with them. otherwise, NHM Punjab organization members will not allow them to write the test. At end of this article, we had given the instructions to download the NHM Punjab TB Health Visitor Admit Card for making the candidate work easy. If the details present in the following sections about the NHM Punjab Senior Treatment Supervisor Hall Ticket 2019 are not correct bring it to our notice. We will inform it to the NHM Punjab committee members and then update the data in this page. Please, Make sure that you carry all the specified documents along with the nhmpunjab.in Hall Ticket. As you all know that Identity proofs are very important for verification purpose. You need to carry any one of the following list of documents. Are you going to attend the NHM Punjab Examination? Then you must carry the nhmpunjab.in Hall Ticket along with you. Candidates who had applied for the NHM Punjab Recruitment can download their Admit Card by following the below provided procedure. First of all, the applied candidates must and should visit the official site of the National Health Mission (NHM) Punjab. The official website is nhmpunjab.in. Then you will get the home page of NHM Punjab on the screen. In that move to the Latest Carrer News section which is at the right of the home page. Throughout that section check for the NHM Punjab TB Health Visitor Admit Card link. If you got the link then click on it. Fill the required details and crosscheck once. If you don’t provide the details correctly you may not get the NHM Punjab Senior Treatment Supervisor Hall Ticket 2019. After crosscheck hit on the submit button. You will get the nhmpunjab.in Hall Ticket on the new page. Download the Hall Ticket and take two to three copies of it for further process. All The Best for the candidates who are going to attend the NHM Punjab Assistant Examination. Do not forget to carry your NHM Punjab TB Health Visitor Admit Card along with you. For more information keep visiting our web site freshersnow.com.